As we enter a new quarter of the year, most of us are probably doing a little reflecting on the previous quarter. If you didn’t, you may find yourself frustrated, trying to figure out where you went off course. Here’s a crazy thought, maybe it wasn’t the business itself that fell off the tracks. As you review the past quarter, do you feel excited about your progress? Even if you didn’t meet your goals, do you see potential in your efforts? Or, do you find yourself simply exhausted and uninspired? If you find that you are struggling to get excited about your business and feel stuck, maybe it’s time to change your perspective. Start by asking yourself why you started down this path in the first place. Most entrepreneurs have pretty specific reasons for striking out on their own, what are yours? More money? More time with family? Following your passions? Freedom to work from wherever you want? The opportunity to help others? What sparked the desire in you? These details, no matter what they are, will be how you define your success. If your business is not fulfilling your vision, it might be because YOU have gone off course. It can be really easy to lose sight of our end goals when we start to feel overwhelmed. Stress is a powerful force and can take a toll if isn’t managed. But when we’re stressed, it can be hard to know where to start to dig our way out. So what now? S- Stop moving. Stop over-thinking. Stop adding to the pile. Just stop for a minute and take a breath. Sometimes the easiest way to regain our sanity is to just take a break. Walk away. Do something else for a minute. While this might seem counter-intuitive, sometimes it’s the only way to clear a cluttered mind. T- Take Inventory. Make a list of everything you need to do or have going on. This will likely go one of two ways: either you’re going to realize it’s not that bad or you are going to realize that your list is very, very long. If it’s not that bad, great! Now you see that you were making a mountain out of a molehill. However, if it really is a mountain, it’s time to prioritize. Organize each task by considering the size of the task, when it is due, how long it will take to complete, and what resources you will need to complete it. Are there tasks you can complete quickly and remove from your list? Great, do that first then take a look at the rest of your to-do list. A- Assess Your Vision and Values. 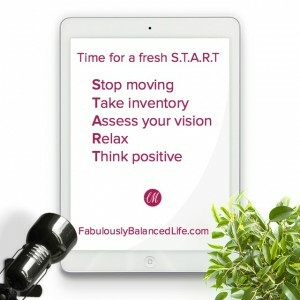 What tasks are going to move you closer to the life and balance you are seeking? These are your priorities. Focus on the items that will move you and your business forward. This could mean choosing a networking event over a social event. It could mean finishing one project before another and being able to identify the potential for future working relationships. Depending on what your end goal is, it could mean interviewing new team members to allow for growth or rebranding your business to clarify your purpose to others. With so many things pulling for our attention every day, we need to be able to admit that sometimes we just can’t do it all. R- Relax. Give yourself a little bit of slack. You are only one person and can only do so much every day. You need to be able to allow yourself breathing room and permission to fall short once in a while. You might find that by simply extending yourself a little bit of grace, a lot of that self-imposed pressure falls away. Some people feel that being busy is the true indicator of success. The truth is that this can be a really detrimental mindset. If you think that constantly putting out fires and going non-stop every day is the path to success, then you will fail in the midst of your “busy”. Clutter comes in all forms, tangible or not, and can completely derail even the most driven individuals. Simplify everything from your desktop to your processes, to your invoicing methods, and even your calendar. By removing all of the extra “stuff” that surrounds you every day, you will be able to think more clearly and move more intentionally in your business. T- Think Positive. Henry Ford once said: “Whether you think you can, or you think you can’t–you’re right.” If you constantly think that you’re failing and never look at your progress, you will fail. Your attitude can literally define your success. If you carry an attitude of excitement and possibility, you will find yourself seeing obstacles as opportunities to challenge yourself and further prove your abilities. Otherwise, you will only see a wall that cannot be moved or overcome. Keep a positive attitude and remember what you are capable of. It is vitally important to remember who we are and why we do what we do so that we can push through the tough times and create a successful business and balanced life. We will all have bad days, that is just a part of life. What makes the difference is how we turn that bad day around. Do we dwell on our failures or do we push through them and add them to our list of obstacles we have had to overcome to earn our successes? Never forget why you do this. Don’t let the temporary stresses become a permanent mindset. Keep moving forward and building the life you desire. A monthly review or any review of your progress may be one of the most important steps in growing your business and in improving any area of your life. Register today for our Monthly Review and Planning workbook and you also receive access to our FREE Facebook Community where you can ask questions and find support among other entrepreneurs with similar interests.